Colmar welcomes parents and grand-parents who search a family destination to have a good time with their children or grand-children, to play with them, or even to learn with them. The historical center can be discovered in a playful way on foot or with a bike. A lot of signs give succint explanations to significant places of the heritage. Playgrounds are scattered all over the town for the children's greatest pleasure. You can cover the town with a city train and/or go on board for a peaceful walk with the stream along the Little Venice. For the most sporties let's meet at the swimming pool, at the ice-rink, at the bowling, at the equestrian center, on the Ill's branches to canoe in the forest on a secure route from tree to tree,ect. For the ones that prefer cultural activities, explore the museums and the libraries and give in to temptation with a showing! 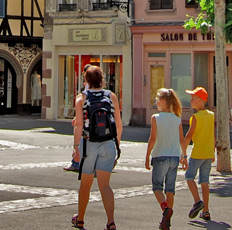 Colmar is also a great point of departure for numerous family trips. You like eagles, storks, butterflies, monkeys and other fishes? A park is dedicated to each of these animals a few kilometers from Colmar. Learn more about the Alsatian culture at the Alsace's Ecomusée. Do you have a spirit of adventure? Explore the castles of the region. At last do not forget to consult the events' calendar not to miss a single opportunity that you could share with your family. The most expected event is: the Magic of Christmas in Colmar! Colmar, a family destination !